I tend to prefer the cheap, simple, not so fancy, and informal restaurants over the trendy, expensive new ones. It’s a mix of not wanting to spend too much money for a meal and a preference for the more traditional food; from any country. 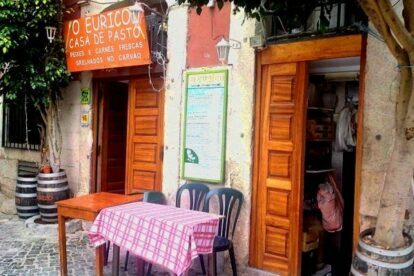 This is the reason why I want to point out Restaurante O Eurico. I can say I have the same theory when travelling to other countries; or other cities for that matter. I want to taste the real, normal food from the place I’m visiting. Even if this means risking eating something I will not like; I’m a food lover so I have to have a taste. Eurico is another Portuguese food restaurant I like to go to and recommend to anyone visiting my neighbourhood. The food is great, home made style, and comes in generous portions; maybe too much for those not used to it. This place also serves great grilled fish or meat. Don’t expect a great service but be prepared to eat well and a lot. And it’s not expensive at all. Eurico is a place frequented by the Portuguese, tourists passing by and residents from the area. It’s an experience of taste, joy, tradition and festivity often coddled with loud talk and wine toasts. A feast for the open minded and unpretentious that might end up chatting with the locals and having a few more glasses of red wine. A must go every time my father in law visits us!